All of our wood smoked bacons start as lean pork bellies that are carefully selected from Canadian family farms and hand-trimmed by our butchers to exacting specifications. Then the slabs are marinated in dark maple syrup brine and double smoked to create hearty, thick-cut bacon that’s more boldly flavorful than you’d expect. We smoke our meats lazily, at low temperatures resulting in a tender, flavorful finish. As a featured ingredient in a savory signature dish or crisply seared on its own, our bacon is some of the best you’ll ever try. The meat is marinated in a dark maple syrup brine, and double smoked to create hearty bacon that is more boldly flavorful than you’d expect. 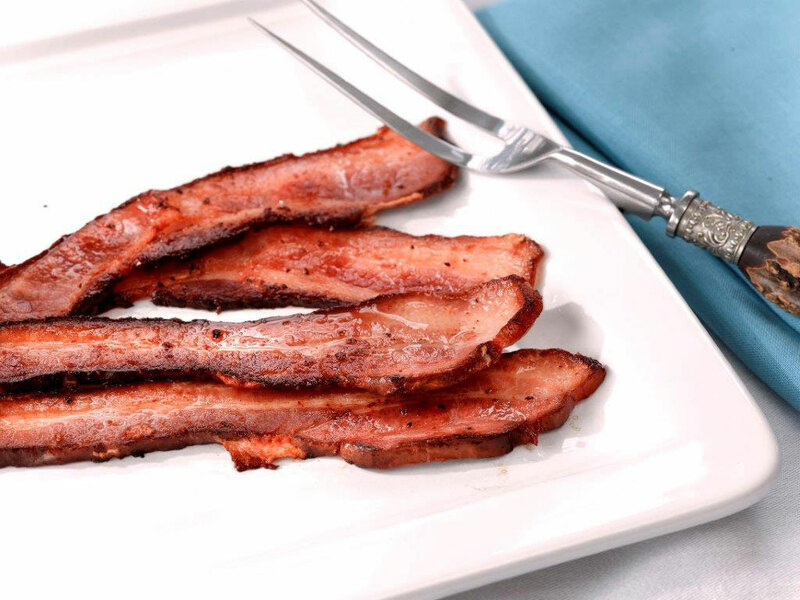 This bacon is hand-crafted, with a meaty flavor and a natural wood smoked scent that signals its supreme quality. A center cut pork loin, immersed in our infamous maple brine and rolled in cornmeal. An all-natural recipe, made with antibiotic free pork, with no preservatives or nitrites used. This bacon is maple cured for a sweet, smoky flavor. Made with organic, vegetarian-fed, non-GMO, antibiotic free pork, with no preservatives or nitrites used. This bacon is maple cured for a sweet, smoky flavor. Smoked over Applewood embers, this is a hearty slab that you can prep as you like. Enjoy in strips, cut thick, meatier strips, or dice into pieces. Lay the bacon flat on a cookie sheet (with ridges to catch grease) and oven bake 'low and slow' at 350°F for 20 minutes or to desired crispyness. For faster cooking, pan fry until crispy.